On Friday night I went to see Grease at the Mayflower theatre in Southampton. I've loved the story since I was a little girl and so as soon as the show started, happy feelings of childhood came flooding back! The characters were well cast and very talented, the lighting was impressive and it was an overall charming performance with something for all ages - there was a lot of sexual reference which surprised me! My favourite song was summer loving, (classic! ), and Greased lightning was also really 'wow'. 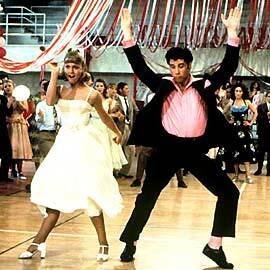 A Grease dress up night may be in order soon...maybe for my birthday hmmmm. oh i would really love to watch this play at a theatre! I've seen the movie so many times and love it so much!